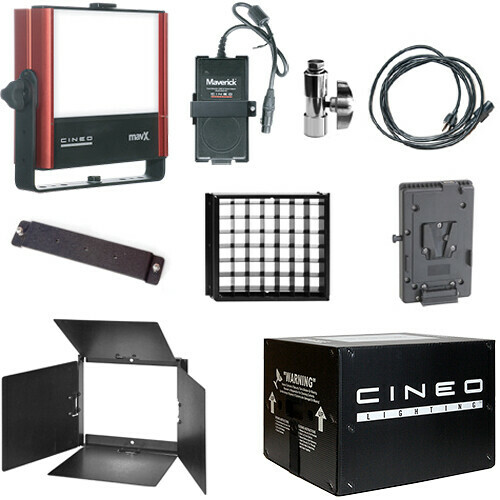 The Cineo Lighting MavX Travel Kit includes the MavX Fixture, a 150W AC adapter, a 6' AC power cord with Edison plug, a V-Lock battery adapter, a TVMP connector, a yoke mount, and a carry case. The Cineo MavX provides all the color rendering and output benefits of the Remote Phosphor technology, while offering the ability to color tune from 2700K to 6500K. It delivers a volume of light equal to a traditional 1K soft source with no color shift or flicker at any output level. The MavX uses passive thermal management for completely silent operation. It supports Photo-Accurate Dimming, which matches the dimming curve to the camera stops. Local control is simple and intuitive, complemented by both wired and built-in wireless DMX control. For studio applications, MavX delivers up to 8000 lumens suitable for lighting broad areas where grid height is challenging. Box Dimensions (LxWxH) 24.0 x 21.0 x 12.0"